Well, we went on the night tour of Petra last night and really enjoyed it. They light thousands of candles to illuminate the the route through the Siq to the Treasury and the space in front of it. There is then a folk music performance which echos around the walls of the canyon. Today we wound up hiring a car and driver and went north on the King’s Highway, stopping at several sites along the way. 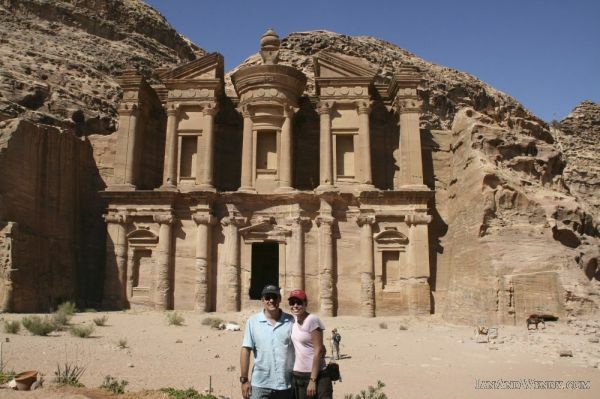 We started off with “Little Petra” – really little. Then we stopped at Shobak Castle – one of the Crusader forts. When they say it fell to the Mamluks they’re not kidding. Not much to see. Then we stopped at a view point and drove through a huge valley that we can’t remember the name of right now. Beautiful. Next we continued on to Karak Castle – biggest of the Crusader forts – less fallen down. Spent about an hour there. Great views out over the surrounding countryside. From there we went to Mt. Nebo – where Moses went up to see the Promised Land before dying. There’s a church there with some beautiful mosaics too. Great views out over the Dead Sea and beneath the smog apparently Jerusalem. On a clear day you can apparently see Hebron, Bethlehem, the Dead Sea, Qumran, Jerusalem, Ramallah, Jericho, Nablus, and Lake Tiberias. A bronze memorial near the lookout symbolizes the suffering and death of Jesus Christ on the cross, and the serpent that Moses ‘lifted up’ in the desert. Mosaic map inside St. Georges Church. Finally we stopped in Madaba to see some more mosaics – the Greek Orthodox Church there has a mosaic that’s some 1500 years old and is a map of the region including the Dead Sea and Jerusalem. We also went to the Archaelogical Park there which is small but has some nice mosaics too. Now we’re in Amman. We’ve changed our flight so we will be returning to Tel Aviv a day early.